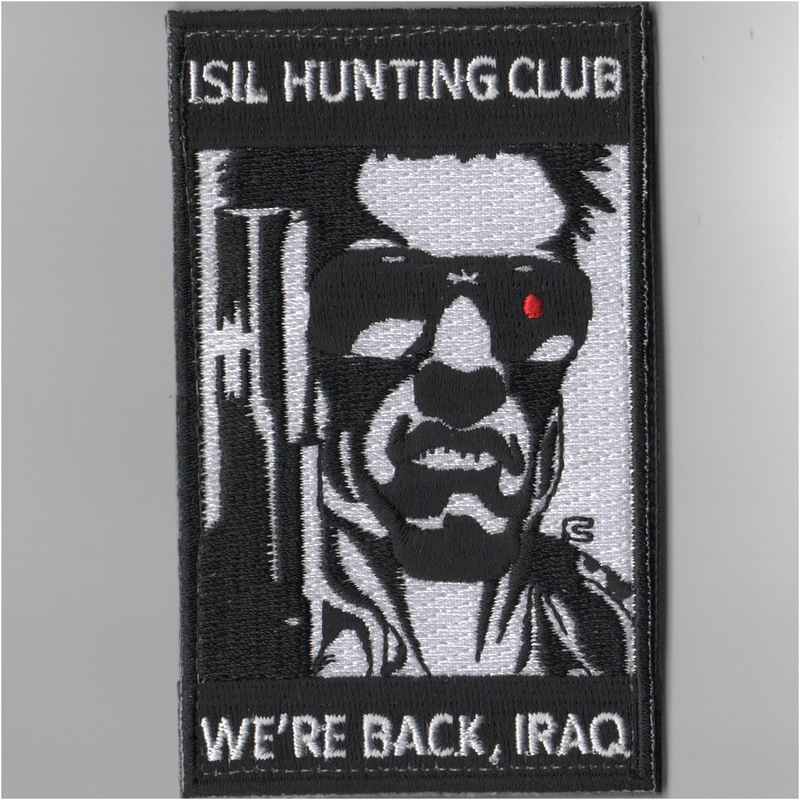 This is the "ISIL HUNTING CLUB" patch depicting the "Terminator" on it and says "We're Back, Iraq". 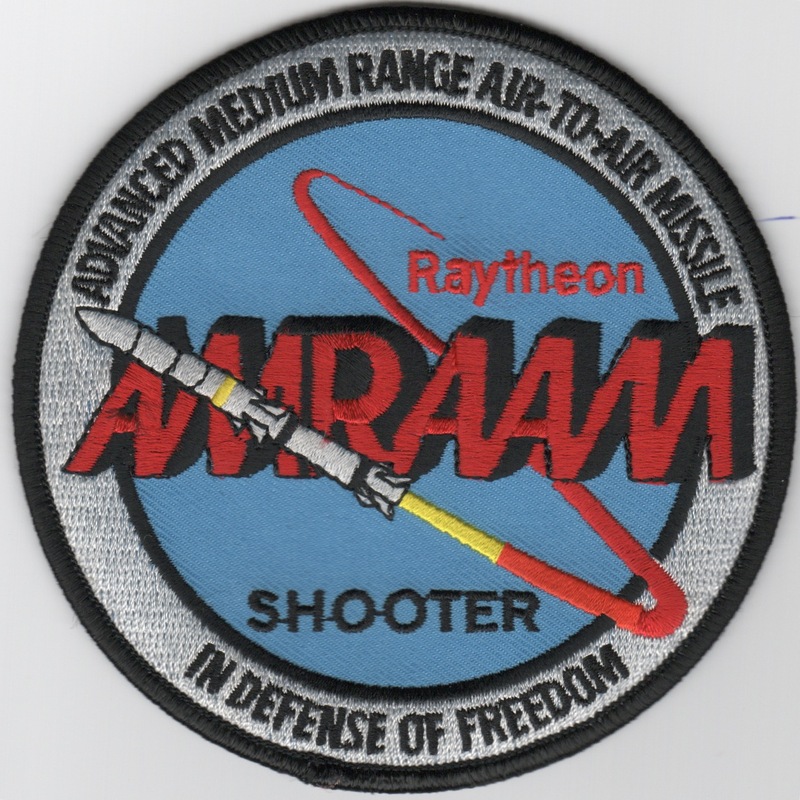 This patch DOES come with velcro. 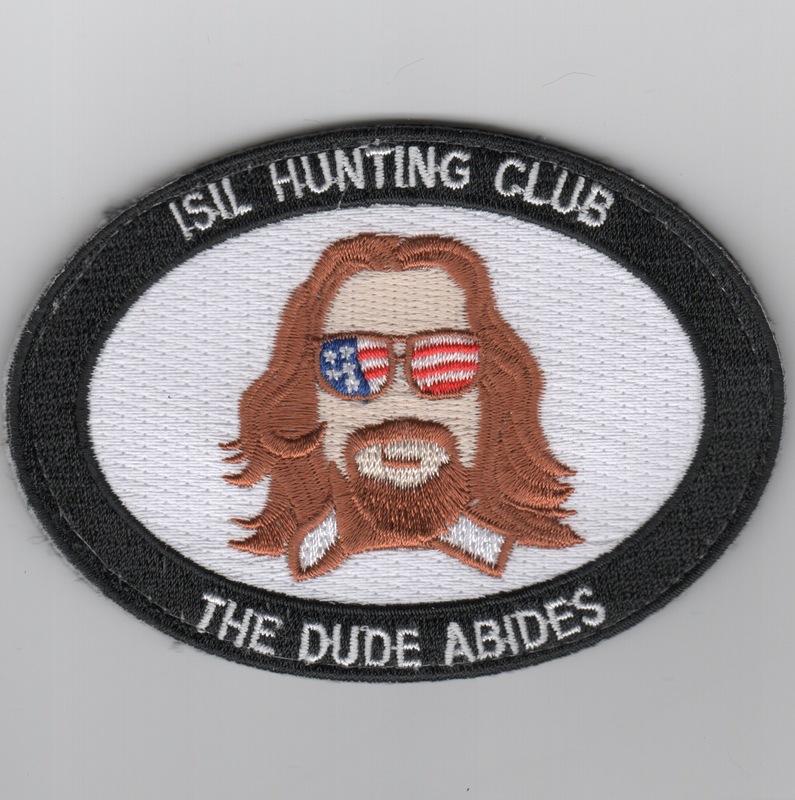 This is the "ISIL HUNTING CLUB" patch depicting "The Dude" on it and says "The Dude Abides". 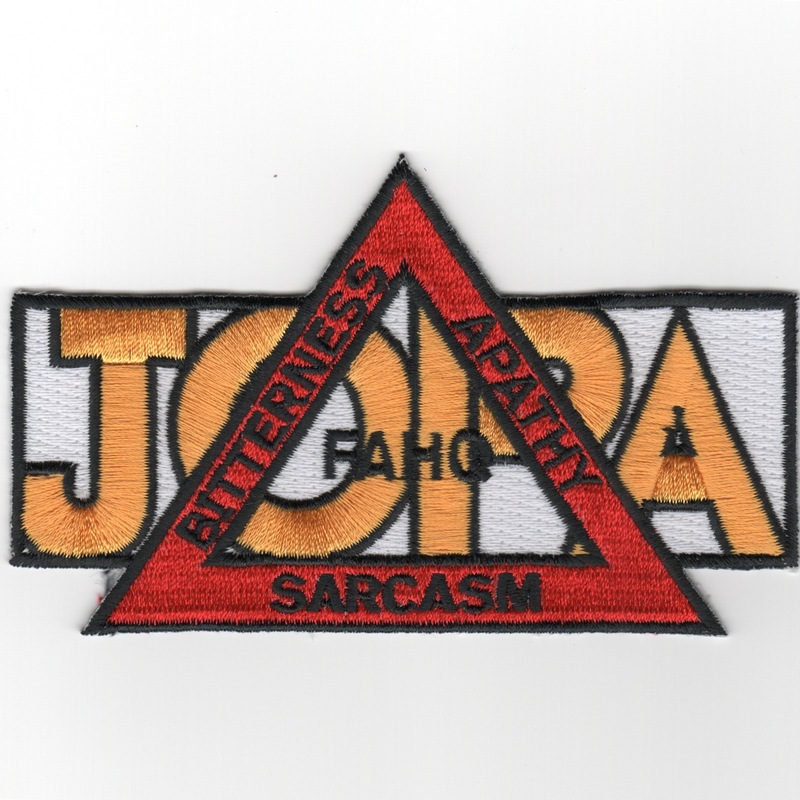 This patch DOES come with velcro. 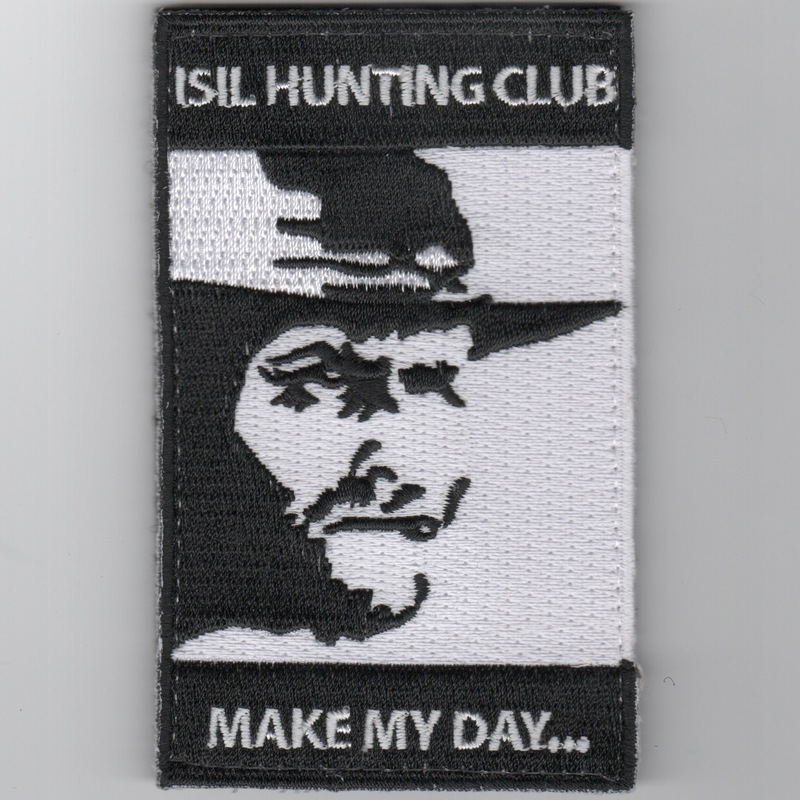 This is the "ISIL HUNTING CLUB" patch depicting Clint Eastwood on it and says "Make My Day...". This patch DOES come with velcro. 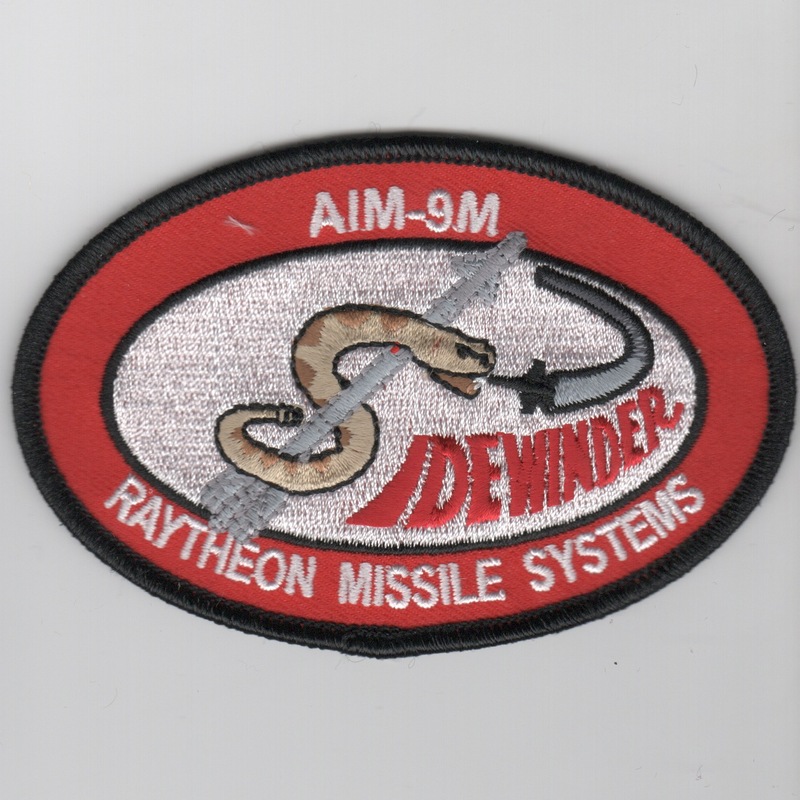 This is one of the U.S. Navy Crew Chief patches. 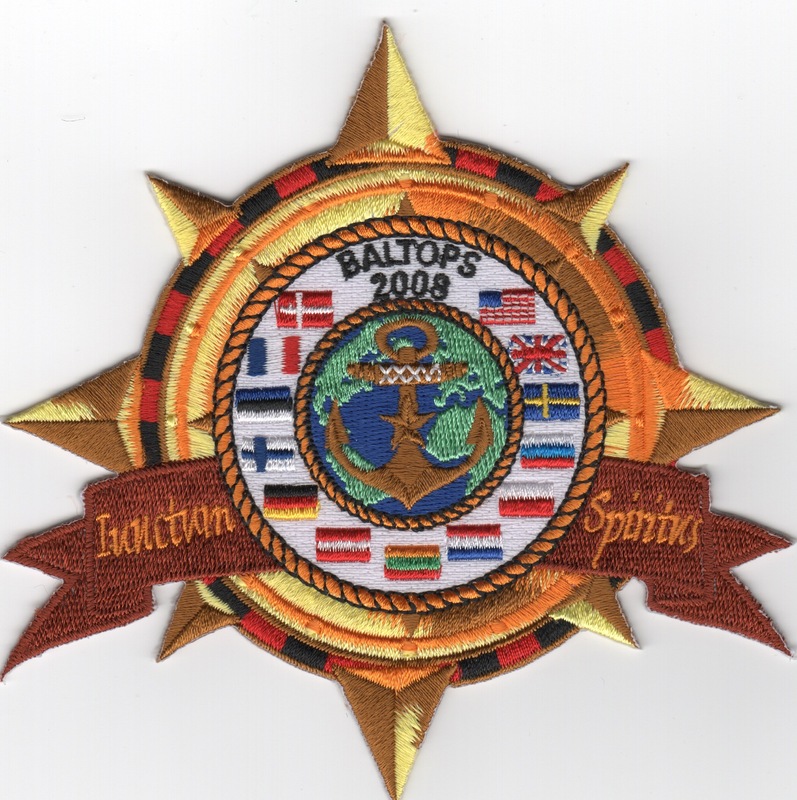 The patch is a mostly round double rocker patch. 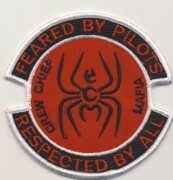 It shows a spider in the middle with the words "Crew Chief / Mafia" around it. The right rocker says "FEARED BY PILOTS". The left rocker says "RESPECTED BY ALL" True words . . . 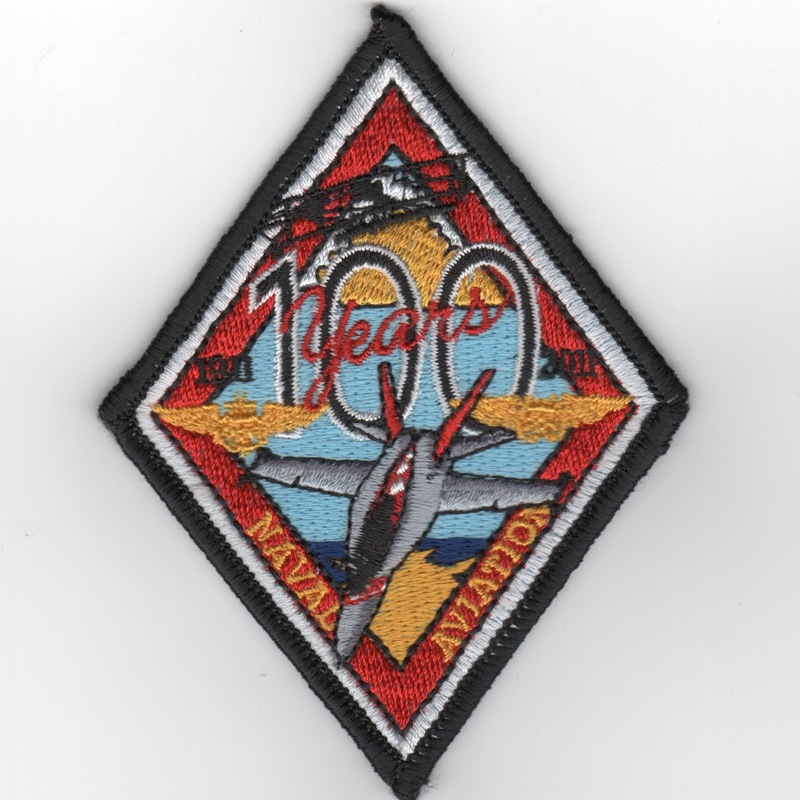 This is the airshow patch created for teh 2003 Misawa (Japan) Air Festival and says "Forging Friendships...Protecting the Pacific". This was the last airshow for the VF-154 Black Knights. 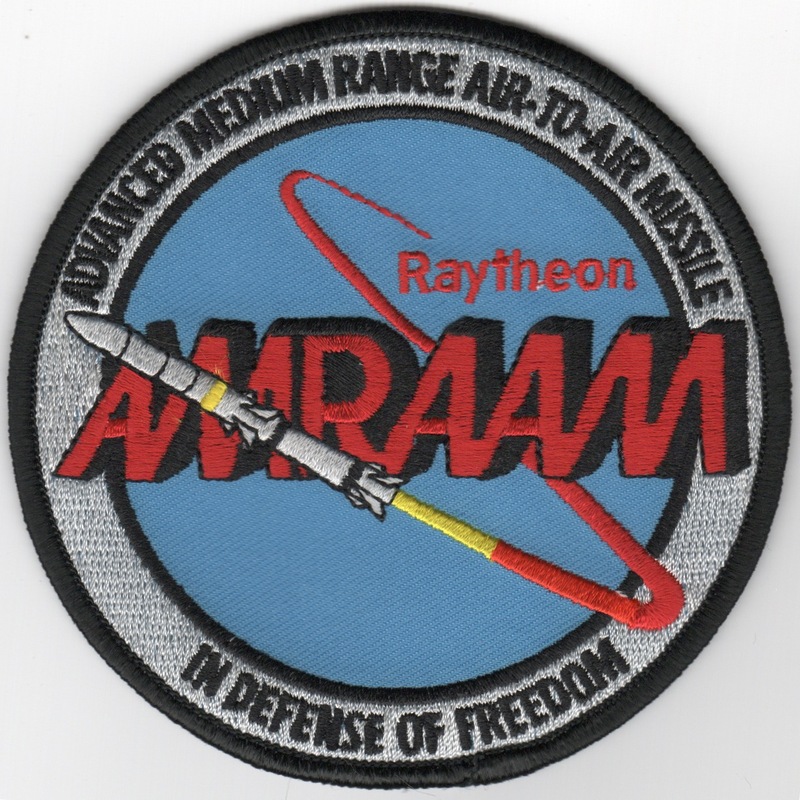 This is the new version of the AIM-54 Phoenix radar guided air-to-air missile patch. 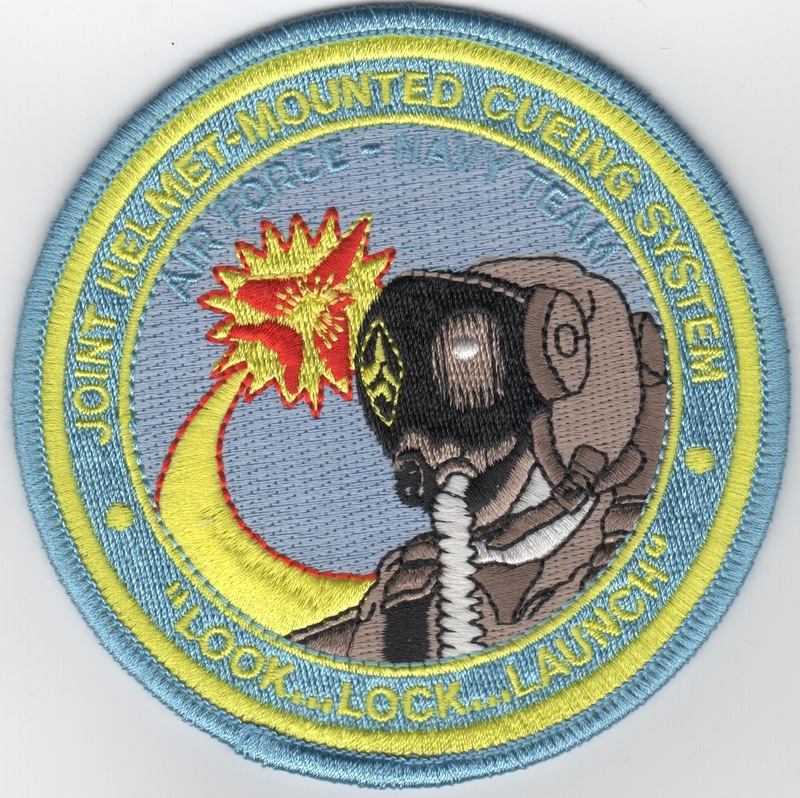 This is the Joint Helmet-Mounted Cueing System (HMS) patch created for those working on this "joint" endeavor. It says "Look...Lock...Launch" along the bottom. 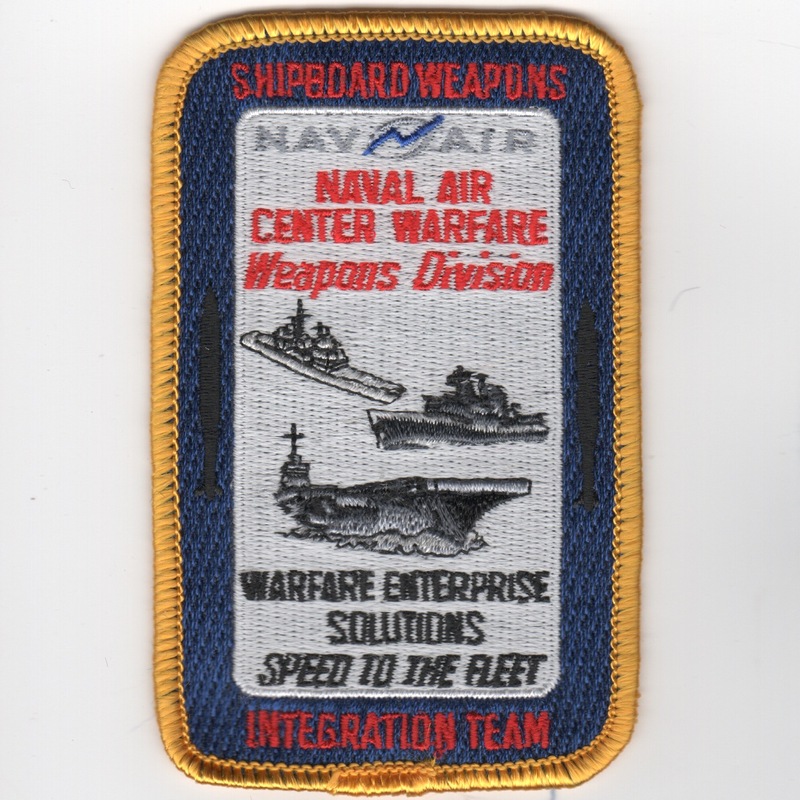 This is the NAVAIR 'Shipboard Weapons Integration Team' patch created for the Naval Air Center Warfare-Weapons Division that says "WARFARE ENTERPRISE SOLUTIONS" and "SPEED TO THE FLEET". This patch does not come with velcro. 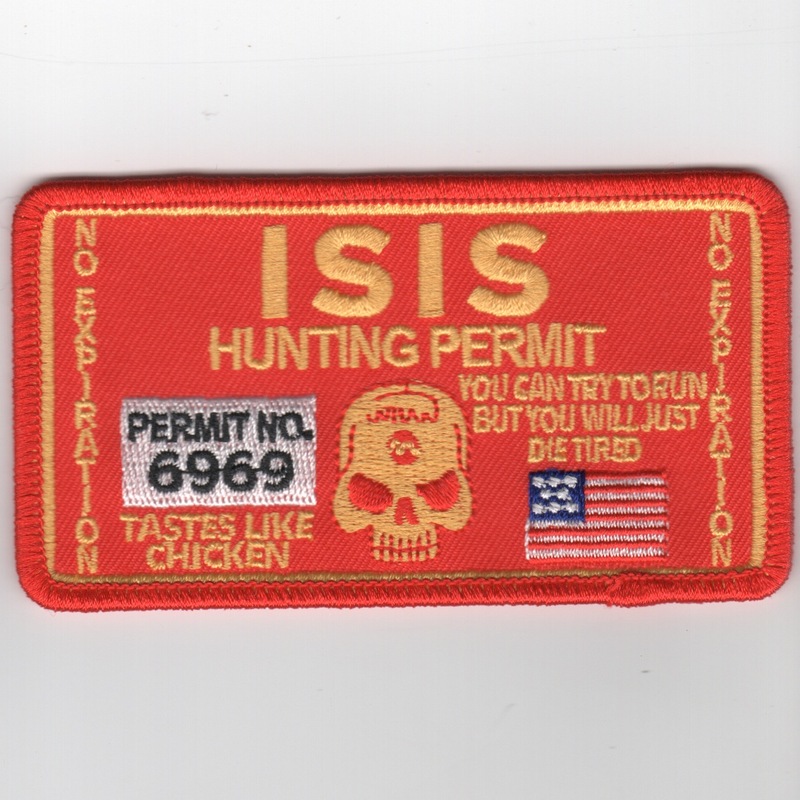 This is the now famous "Elmer Fudd" patch that states "We're Hunting I-Wackis"!! This is a Civil Air Patrol squadron in Horsham, PA at the Willow Grove NAS. 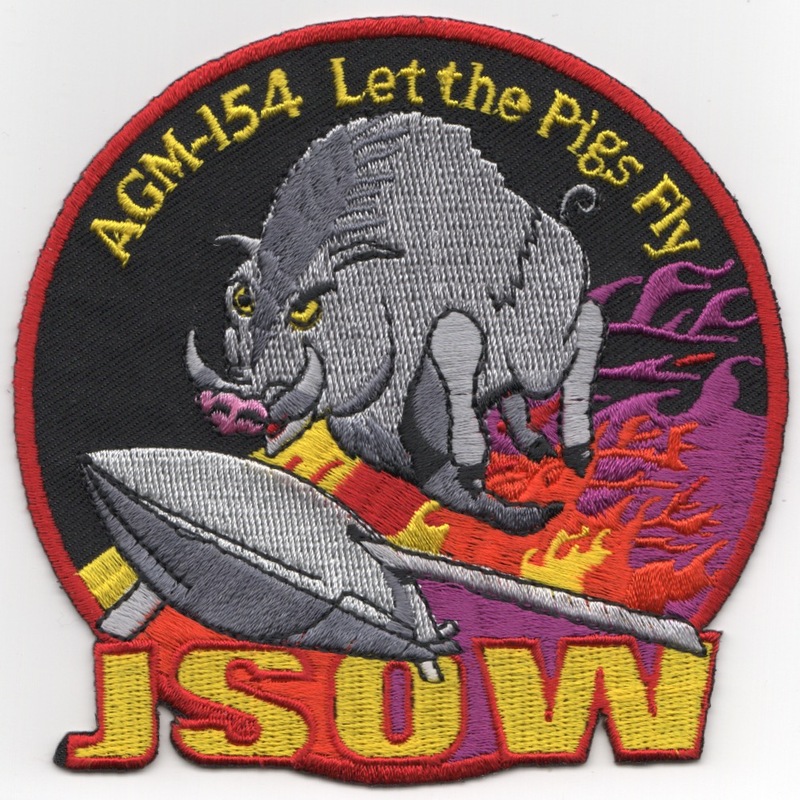 Got this patch from the 'Zappers' of VAQ-130 so I have to give them "props" for it. 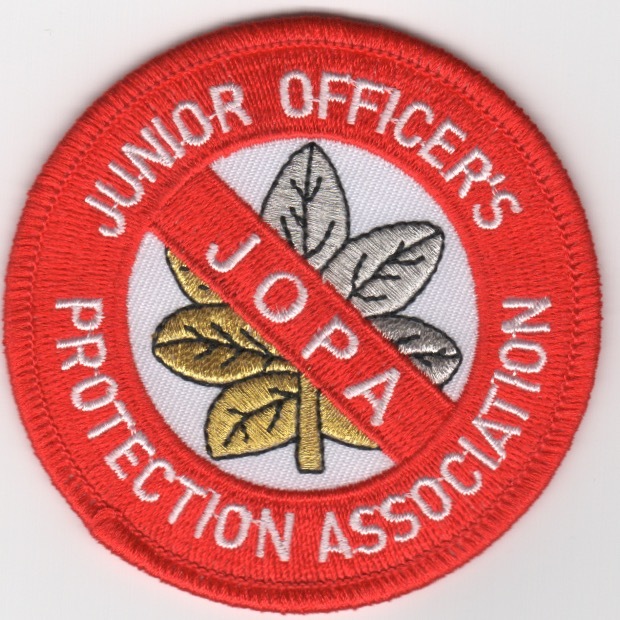 This is one of the Junior Officer Protection Agency (JOPA) patches we have and does not come with velcro attached. The Chief of Naval Operations (CNO) is a statutory office held by a four-star admiral in the United States Navy, and is the most senior naval officer assigned to serve in the Department of the Navy. The office is a military adviser and deputy to the Secretary of the Navy. In a separate capacity as a member of the Joint Chiefs of Staff the CNO is a military adviser to the National Security Council, the Homeland Security Council, the Secretary of Defense, and the President. 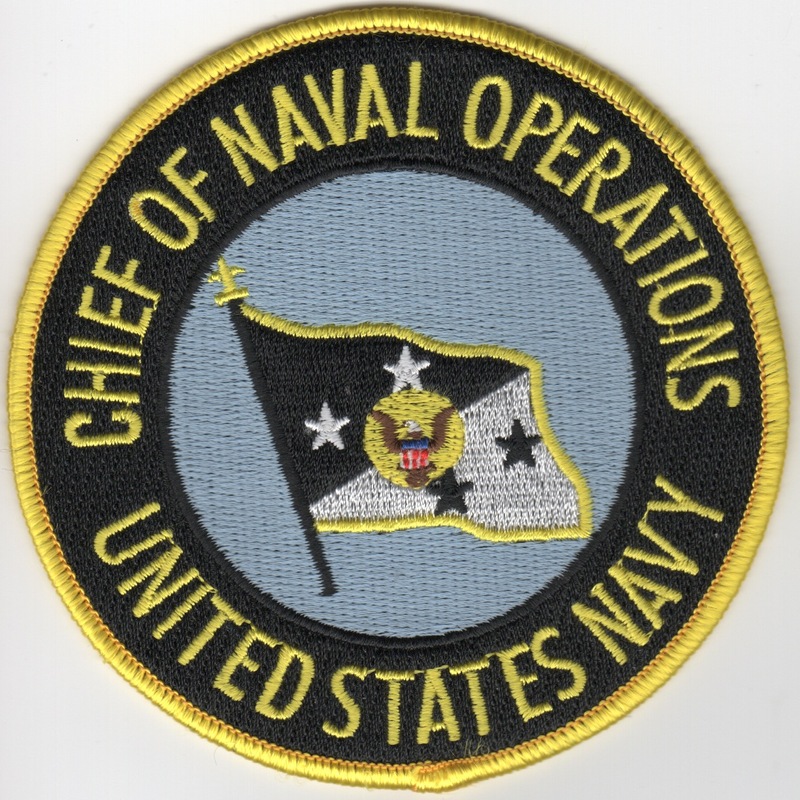 The Chief of Naval Operations is an administrative position based in the Pentagon, and while the CNO does not have operational command authority over Naval forces as the title implies (that is nowadays within the purview of the Combatant Commanders who report to the Secretary of Defense), the CNO does exercise supervision of Navy organizations as the designee of the Secretary of the Navy. This version has the Navy's Flag in the center. It does not come with velcro attached. The Chief of Naval Operations (CNO) is a statutory office held by a four-star admiral in the United States Navy, and is the most senior naval officer assigned to serve in the Department of the Navy. The office is a military adviser and deputy to the Secretary of the Navy. In a separate capacity as a member of the Joint Chiefs of Staff the CNO is a military adviser to the National Security Council, the Homeland Security Council, the Secretary of Defense, and the President. The Chief of Naval Operations is an administrative position based in the Pentagon, and while the CNO does not have operational command authority over Naval forces as the title implies (that is nowadays within the purview of the Combatant Commanders who report to the Secretary of Defense), the CNO does exercise supervision of Navy organizations as the designee of the Secretary of the Navy. This version has the Eagle in the center. It does not come with velcro attached. 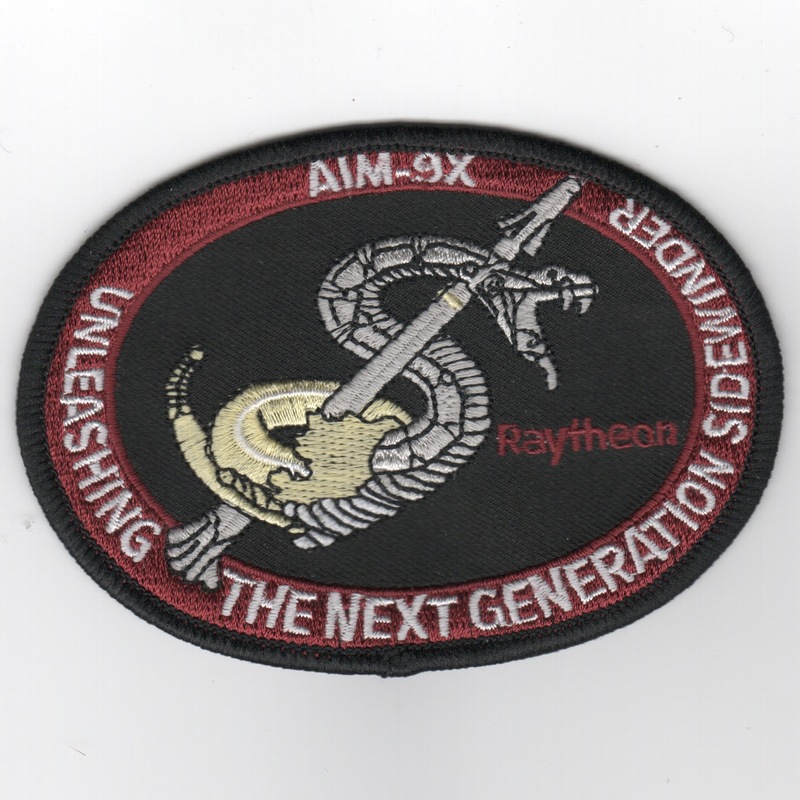 This is the EFM patch for the Navy's X-31 Aircraft. It stands for Messerschmitt-Bolkow-Blohm (MBB) X-31 Enhanced Fighter Maneuverability (EFM). This is the mascot patch for the US Naval Academy. 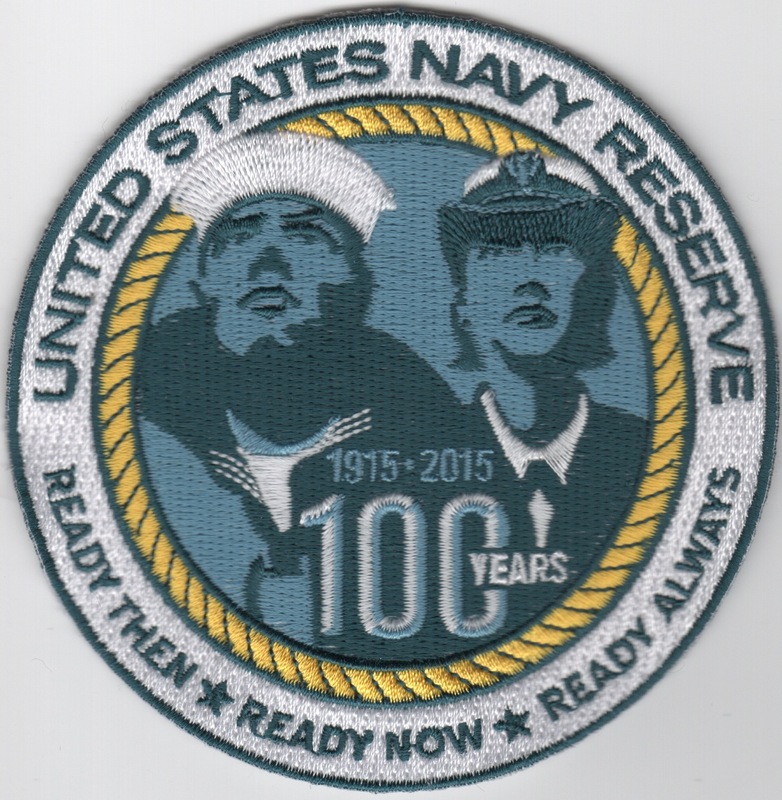 This is the large diamond version of the Naval Air Reserve's 75th Anniversary Patch. The dates are from 1916-1991. 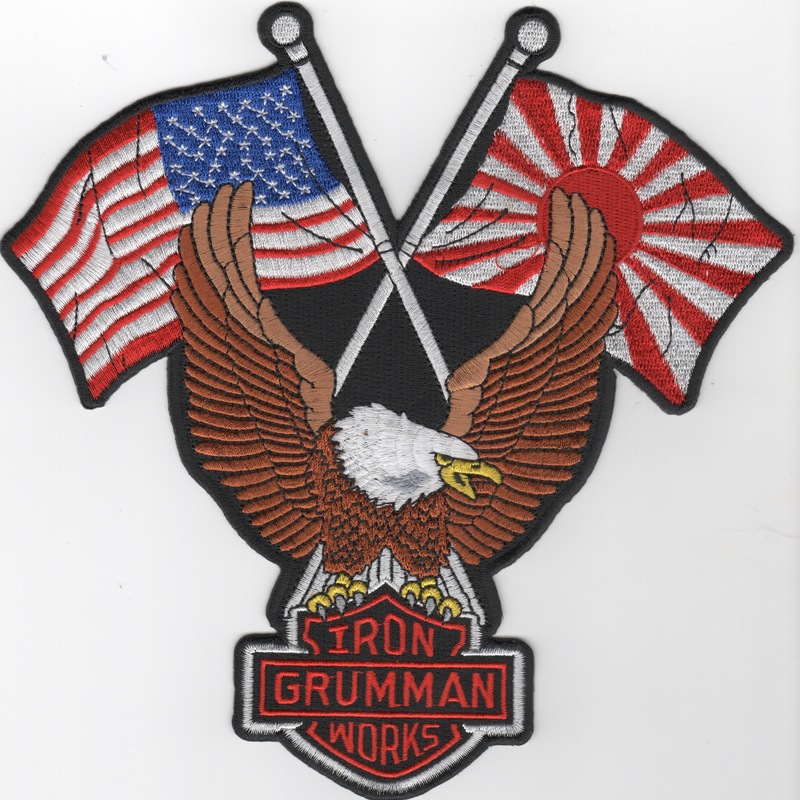 This is the patch for the commander of the Atlantic fleet fighters, attackers, and airborne early watchers. They are known as FIT, MAT, and AEW. The Navy's acronym for this man is COMFITMATAEWWINGSLANT and this is his patch. The United States Second Fleet was a numbered fleet in the United States Navy from 1950 until its disestablishment in September 2011. 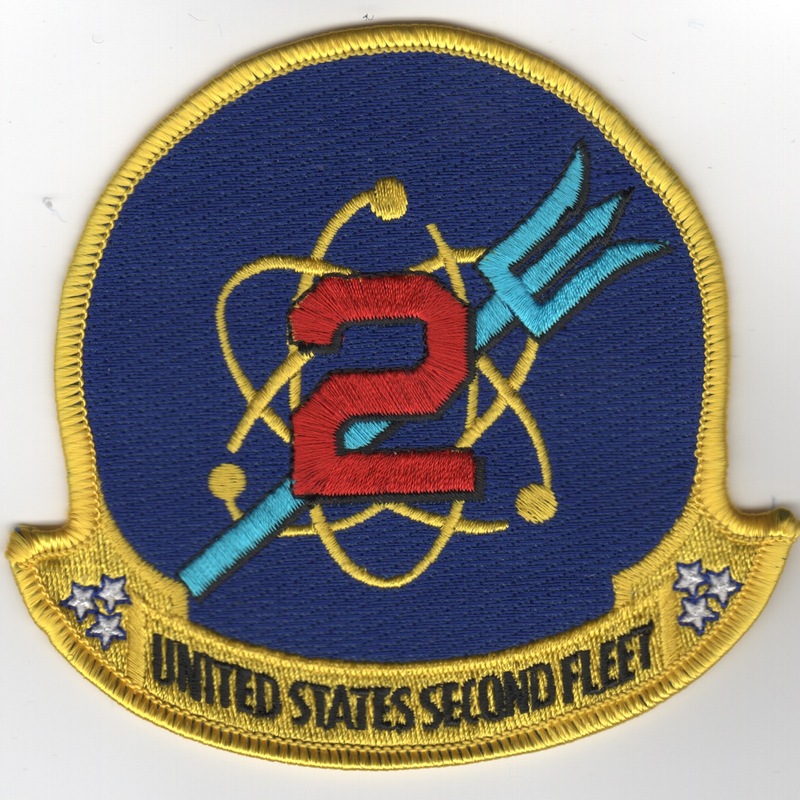 Second Fleet's area of responsibility included approximately 6,700,000 square miles (17,000,000�km2) of the Atlantic Ocean from the North Pole to the Caribbean and from the shores of the United States to the middle of the Atlantic Ocean. Second Fleets West Coast counterpart was United States Third Fleet. Prior to disestablishment, Second Fleet oversaw approximately 126 ships, 4500 aircraft, and 90,000 personnel homeported at U.S. Navy installations along the East Coast. The Third Fleet is one of six numbered fleets in the United States Navy. Third Fleet's area of responsibility includes approximately fifty million square miles of the eastern and northern Pacific ocean areas including the Bering Sea, Alaska, the Aleutian Islands and a sector of the Arctic. Major oil and trade sea lines of communication within this area are critically important to the economic health of the United States and friendly nations throughout the Pacific Rim region. First established in 1943, the Third Fleet conducted extensive operations against Japanese forces in the Central Pacific during World War II. Deactivated in 1945, the fleet remained inactive until 1973, when it was reactivated and assumed its current responsibilities. 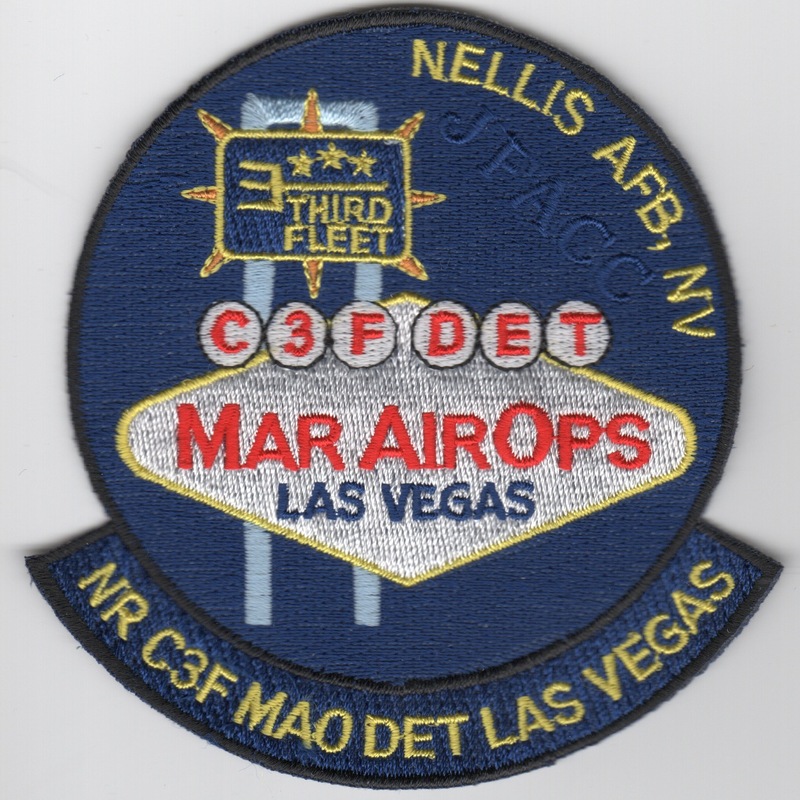 This patch was created for their "det" to Las Vegas for MAR AIR OPS. It does not have velcro attached. The Third Fleet is one of six numbered fleets in the United States Navy. Third Fleet's area of responsibility includes approximately fifty million square miles of the eastern and northern Pacific ocean areas including the Bering Sea, Alaska, the Aleutian Islands and a sector of the Arctic. Major oil and trade sea lines of communication within this area are critically important to the economic health of the United States and friendly nations throughout the Pacific Rim region. First established in 1943, the Third Fleet conducted extensive operations against Japanese forces in the Central Pacific during World War II. Deactivated in 1945, the fleet remained inactive until 1973, when it was reactivated and assumed its current responsibilities. 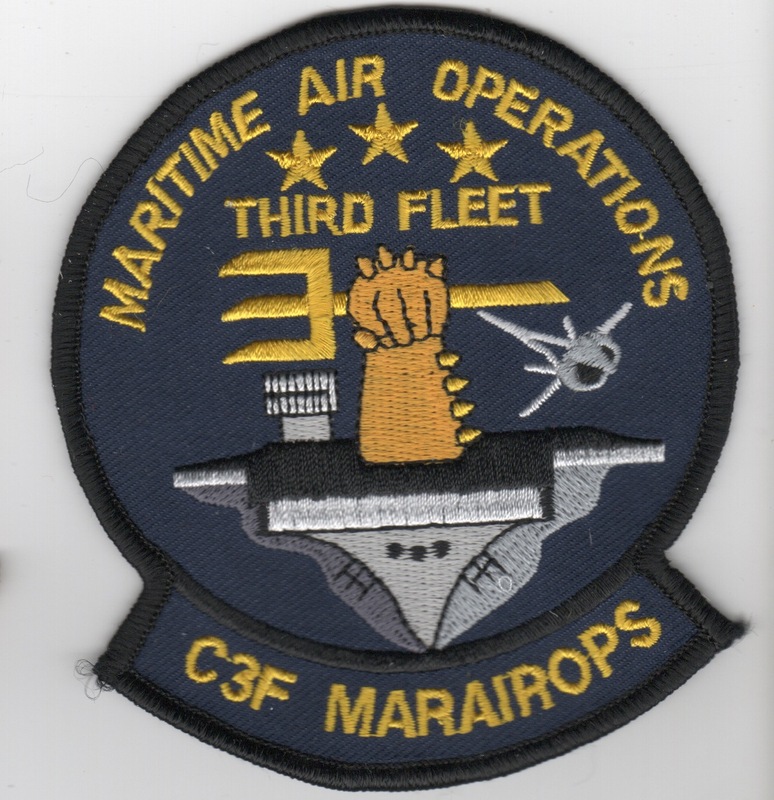 This patch was created for their "C3F" MAR AIR OPS. It does not have velcro attached. 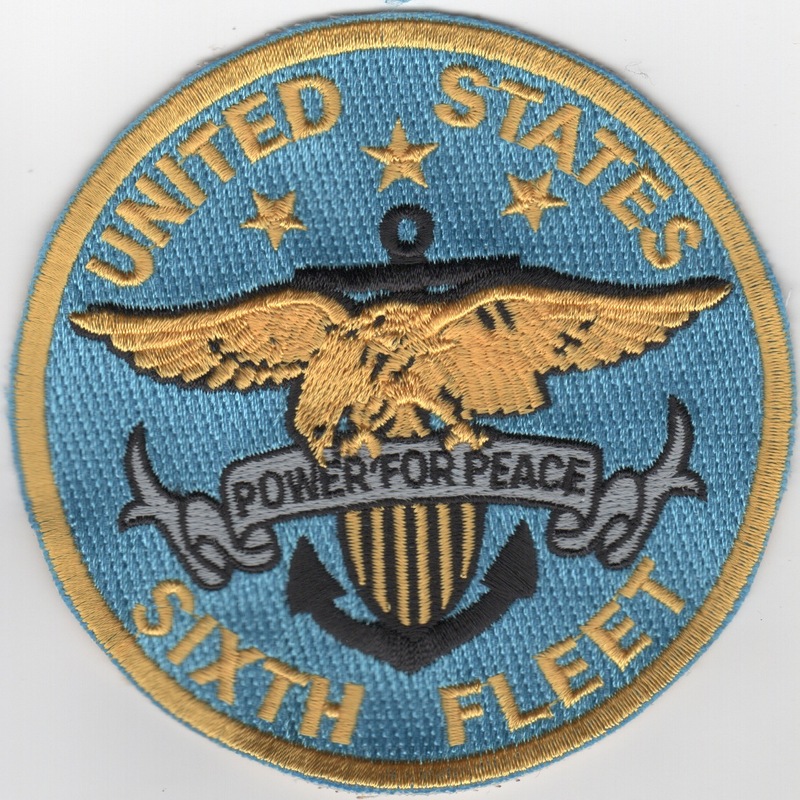 The Sixth Fleet is the United States Navy's operational fleet of United States Naval Forces Europe headquartered at Naval Support Activity Naples, Italy. 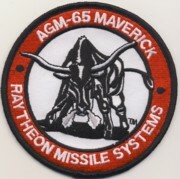 The officially stated mission of the Sixth Fleet in 2011 is that it "conducts the full range of Maritime Operations and Theater Security Cooperation missions, in concert with coalition, joint, interagency, and other parties, in order to advance security and stability in Europe and Africa." The Sixth Fleet was established in February 1950 by redesignation of the former Sixth Task Fleet and since that time, it has been continually engaged in world affairs around the Mediterranean. It was involved in numerous NATO maritime exercises, the U.S. Lebanese intervention of 1958, confrontation with the Soviets during the Yom Kippur War (also known as the October War) of 1973, clearance of the Suez Canal after 1973, and several confrontations with Libya during the 1980s (including Operation El Dorado Canyon). Most recently it launched airstrikes on Libya again during the Libyan Civil War of 2011. This patch does not have velcro attached. 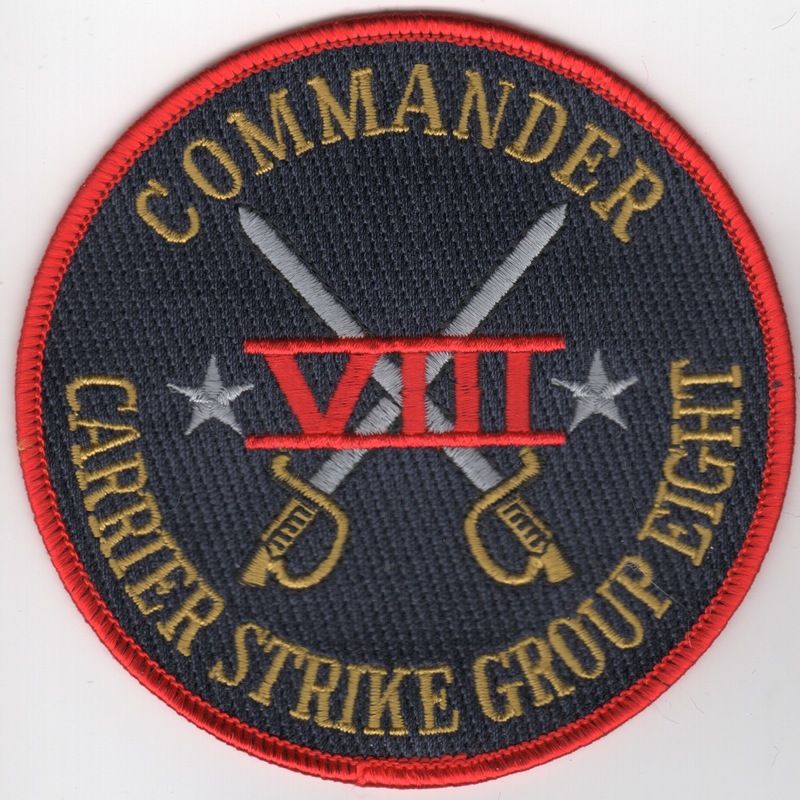 Commander, Carrier Strike Group 8, abbreviated as CCSG-8 or COMCARSTRKGRU 8, is one of five U.S. Navy carrier strike groups currently assigned to the United States Fleet Forces Command. Carrier strike groups gain and maintain sea control as well as project naval airpower ashore. The current group flagship is the Nimitz-class aircraft carrier USS�Harry S. Truman�(CVN-75). The other units of the group are the guided-missile cruiser USS�Hu� City�(CG-66), Carrier Air Wing Seven, and the ships of Destroyer Squadron 28. 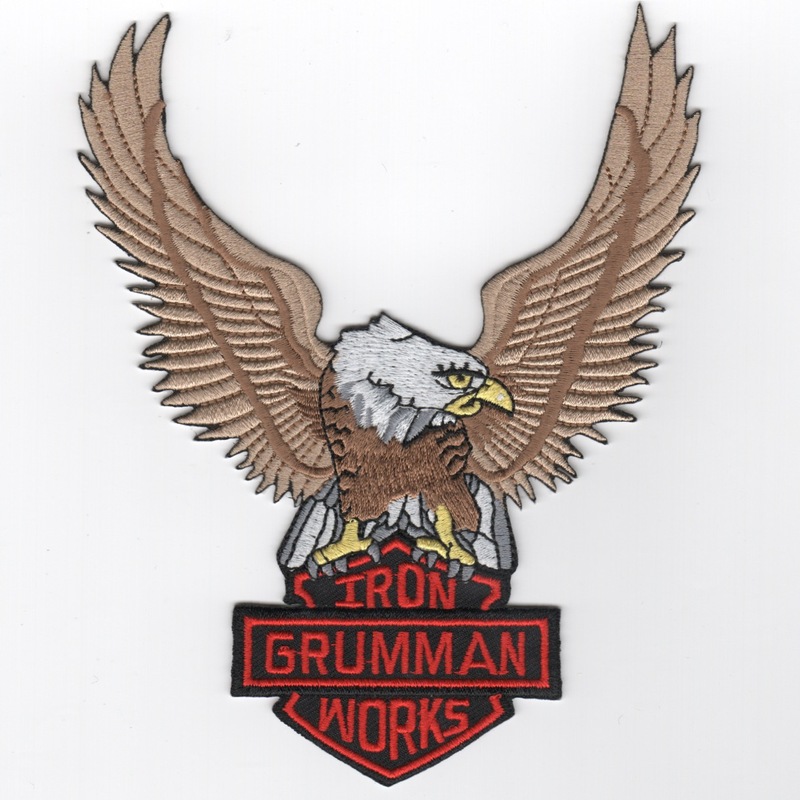 This is the Red/Black version of their patch and does not come with velcro already attached. 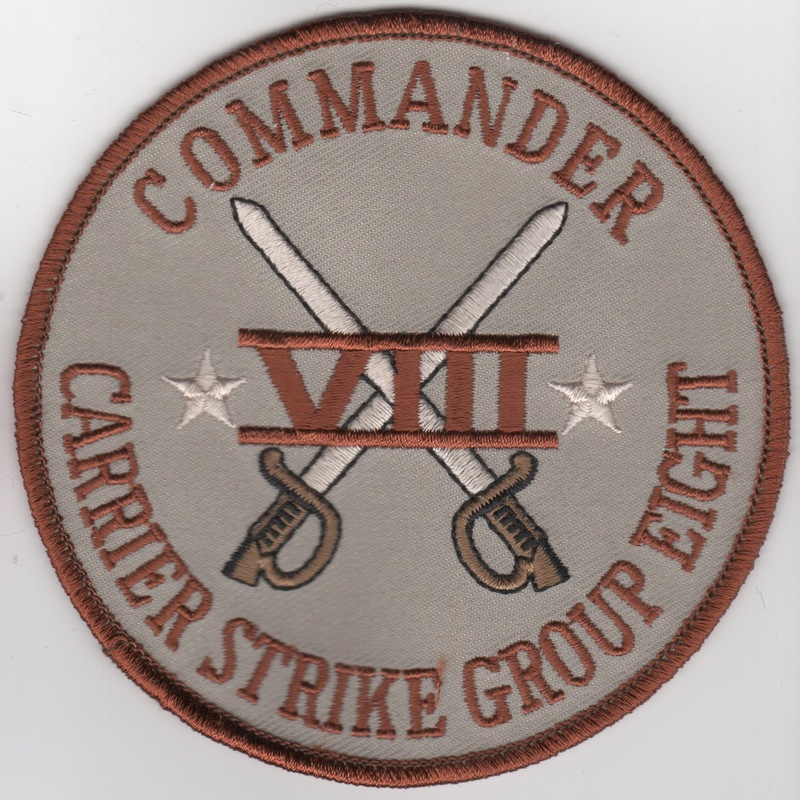 Commander, Carrier Strike Group 8, abbreviated as CCSG-8 or COMCARSTRKGRU 8, is one of five U.S. Navy carrier strike groups currently assigned to the United States Fleet Forces Command. Carrier strike groups gain and maintain sea control as well as project naval airpower ashore. The current group flagship is the Nimitz-class aircraft carrier USS�Harry S. Truman�(CVN-75). The other units of the group are the guided-missile cruiser USS�Hu� City�(CG-66), Carrier Air Wing Seven, and the ships of Destroyer Squadron 28. 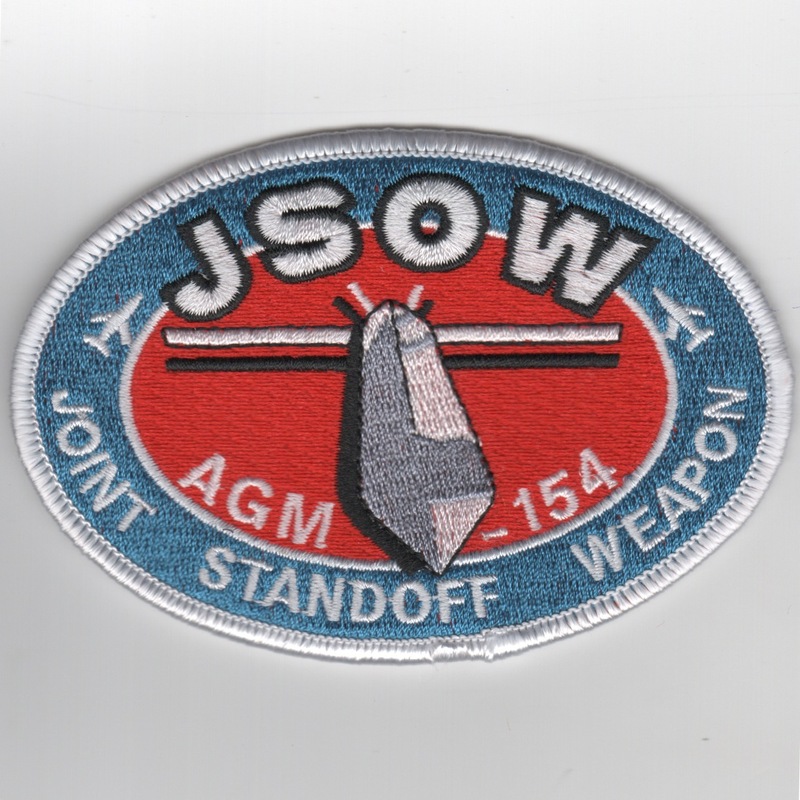 This is the desert version of their patch and does not come with velcro already attached. 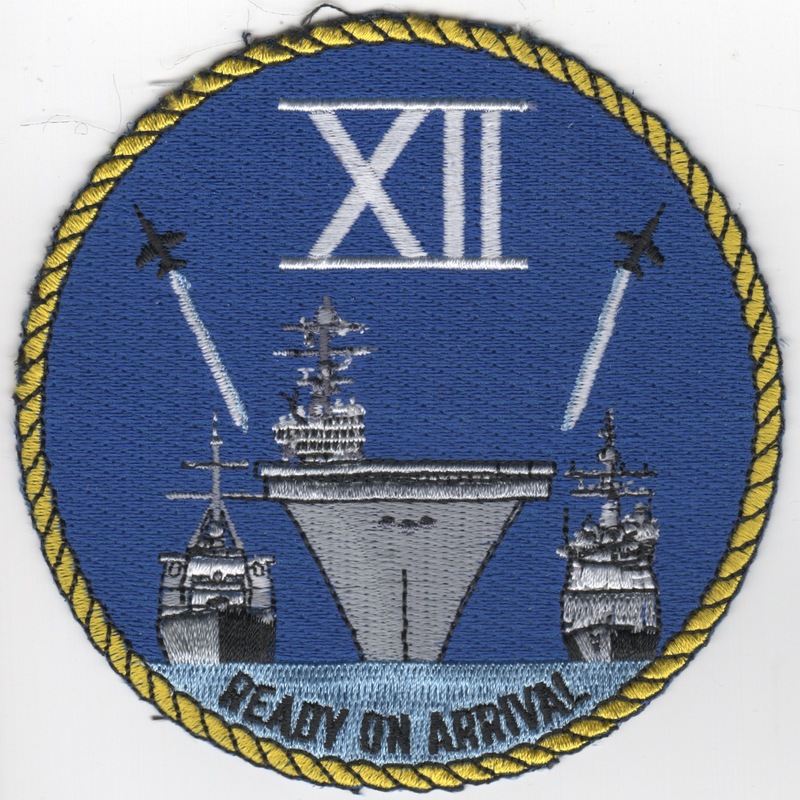 Carrier Strike Group Twelve (CSG-12 or CARSTRKGRU 12) is one of four U.S. Navy carrier strike groups currently assigned to the United States Fleet Forces Command. Carrier strike groups gain and maintain sea control as well as project naval airpower ashore. 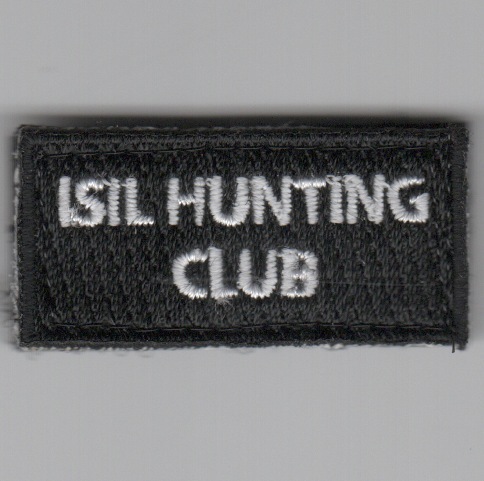 This is the color version of their patch and does not come with velcro already attached. 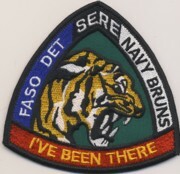 This is the patch for the Naval Sea Combat Systems Engineering Station (SEABAT) located at NAS Norfolk, VA.